HAMILTON - Bo knows satire. Bo knows viral video. Bo knows his song lyrics won't fly in a family newspaper, but Bo doesn't take it personally. 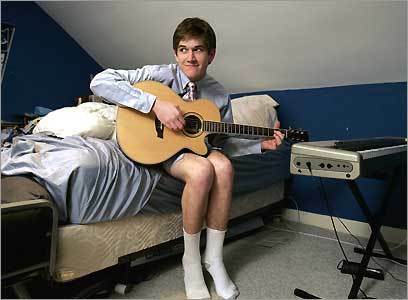 "Most of my songs make fun of myself," Bo Burnham says, defending his taste for R-rated material. "They're about stuff kids my age normally wouldn't laugh at, except they do." Burnham, 17, is a senior at St. John's Prep, an all-boys' Catholic high school in Danvers. If you've never heard of him, you probably haven't spent much time lately surfing video-sharing websites like YouTube or Break.com. If you've seen any of his dozen or so videos, which have generated 10 million Web hits and already brought Burnham a Hollywood agent and Comedy Central booking, you know the "stuff" he sings about is so politically incorrect it isn't funny. Except it is. Take "My Whole Family (Thinks I'm Gay)," a video that debuted on YouTube a year ago and propelled Burnham to Internet stardom. Its theme is self-explanatory, yet how many 17-year-olds dream up lines like, "I was John Elway/Now I'm Elton John"? "Klan KooKout," another Burnham offering, does a comedic number on white supremacists worthy of Randy Newman (sample punch line: "someone loses Schindler's List"). Burnham's latest, "3.14 Apple Pi," drags gangsta rap down alleyways even Snoop Dogg would fear to tread. Then there's "Perfect Woman," a three-minute ode to feminine perfection starring Helen Keller. "I'm going to hell," Burnham predicts on camera after finishing the song, which, if the World Association of People with Disabilities has any say, seems likely. Kids, one hastens to warn, do not hum this at home. Home is where Burnham's heart is, though, at least for now. Each of his videos has been shot in and around his family's house in Hamilton, mostly in Bo's bedroom. Wearing a preppy shirt and necktie or long-sleeved T-shirt, he accompanies himself on the guitar or electric piano, rarely changing expression or camera angle. The effect is simultaneously wholesome and disturbing, intimate in a folksy-creepy sort of way. "Hello, Internet pedophiles," welcomes Burnham as one video rolls. You know he's joking around, playing with the medium. Yet of course they could be watching, too. "At first, I jumped up and down like any parent would and told him to get [his videos] off the Internet," says his mother, Patricia, a staff nurse at St. John's Prep. "They're not exactly mother-friendly, after all." Bo's father, Scott, who runs a North Shore construction company, admits the videos were "a little shocking at first" but says: "The key for us is, this hasn't taken over his life. Bo's a smart, serious, hard-working kid. It's probably overtaken us more than him." Or maybe not. Last month, Burnham flew to London to tape a segment for Comedy Central. He's also recorded a CD for Comedy Central Records, due out later this month, and performed standup gigs at Boston's Comedy Connection. His agent, Douglas Edley, represents a stable of top-tier comedians that includes Drew Carey and Dave Chappelle. Edley's assistant caught Burnham on YouTube a few months ago and recommended his boss check him out. That was on a Sunday. "Monday morning, I called Bo and said, 'I gotta represent you,' " Edley says by phone from LA. "He's definitely the youngest comedian I've worked with - he was getting ready for his SATs when I called - but the quality of his writing is amazing." As sophisticated as he comes across with a guitar in hand and song on his lips, Burham seems like a pretty regular guy in person. He's tall and lanky (6-foot-5), has been busy with college applications (NYU, USC, Yale), and spends much of his extracurricular energies on high-school theater (next up: a stage production of Homer's "The Odyssey"). He has an older brother and sister who think he's a comic genius. They may be right, but in a one-on-one interview he doesn't crack a lot of jokes or answer personal questions glibly. "I always wanted to be a comedian and actor," he offers haltingly, seated at the family dining-room table on the eve of the London trip. "I basically stumbled into the music medium, though." Musically, he adds, "I'm OK, but that's about it. I like to think I'm good enough not to negatively affect the performance." By age 3, he was performing skits known around his house as Bo Shows. Growing up, he listened to classic rock and to boomer-generation comedians such as George Carlin and Richard Pryor. More than just a comedy fan, though, he's a devotee of puns, palindromes, and other forms of wordplay. And while brilliant at channeling a kind of deviant teenage machismo in his songs, he says he's "really a very vulnerable guy." As Burnham tells it, he was rehearsing a play at St. John's two summers ago when he started writing song parodies about teenage angst. After trying them out on his fellow performers, he videotaped two of the songs and posted them on YouTube, mostly so his older brother Pete, now a junior at Cornell University, could watch them. Viewer response was modest at first. Within a few weeks, though, the videos had migrated to Break.com. Overnight, Web hits jumped from 9,000 to 1 million. College students especially have gone ga-ga for Bo. Despite gaining an agent, website, and cult following in 12 short months, Burnham maintains that Internet fame has had little impact on his daily life. "I only see numbers on a screen," he says, referring to the amount of e-mail and Web traffic he gets. "I don't interact with people much." His father marvels that Bo "hit the YouTube thing at just the right time." His mother admits that watching videos like "Perfect Woman" was tough at first, but says her friends totally "get" Bo's brand of humor now that they've gotten over their initial shock. "George Carlin had a mother who probably didn't like it, either," she adds with a smile. St. John's assistant principal Wendy Olson says school officials are fully supportive of Burnham, an honor roll student and talented actor who is active in the campus ministry program as well. "The Bo on YouTube is not the Bo we see around here," Olson says. "But no one at St. John's is surprised at his creativity or that he's pursuing his dream, which is to make a name for himself." Probably his biggest fan - and first-responder listener - is his older sister, Samm, a second-year student at Suffolk Law School. Her school friends are obsessed with Bo, she says, and for good reason. "I played 'Perfect Woman' at lunch one day, and there were gasps at first - then laughter," Samm says. "Bo pushes the envelope, that's for sure. A lot of YouTube fads get their 15 minutes of fame, but I don't think that's the case for Bo." Burnham plans to release additional videos in bundles of two and three while completing his senior year and awaiting word on college. And yes, he included samples of his raunchiest videos in his application folders. "If that hurts my getting into any place," he says with a touch of teenage defiance, "I wouldn't want to go there anyway."